Safe Because EverChew is Strong! Inside the EverChew rubber ring is a nylon pin that passes through a hole in the chew. 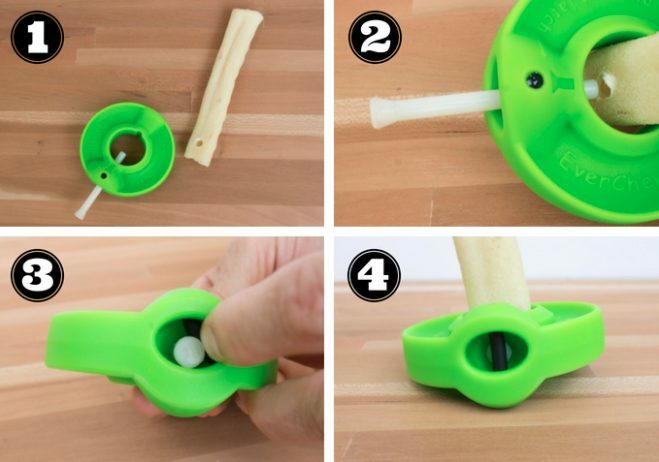 This hole turns a normal dog treat into a safe chew for dogs. We tested many materials for the pin, and the only thing stronger than nylon was metal. However, metal is unacceptable in a safe dog toy. Another good thing about nylon is that it has a track record of being safely used in dogs chews and toys for many, many years. 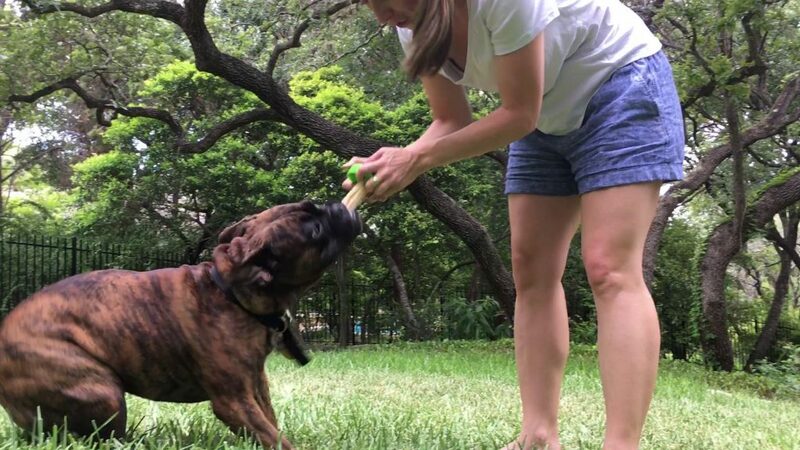 Since the pin passes through a hole in the bully stick or rawhide chew, the only way for a dog to defeat EverChew is (1) by bending the nylon pin up and out of the center hole by tugging on the chew, or (2) by getting the pin past the latch and out of the ring. To prevent defeat (1) from happening, we make the pin as large a diameter as possible, and make the center hole in the rubber ring as small as possible. By optimizing these two variables (based on the average diameter of regular bully sticks), we ended up with a design that passed all testing with our 65 pound Eva. To prevent defeat (2), we latched the nylon pin inside the chew so that it can only be removed with two fingers working simultaneously (see more below). The little video of me with Eva was made to illustrate that the pin could easily withstand the downward force of a (moving) 65 pound dog. 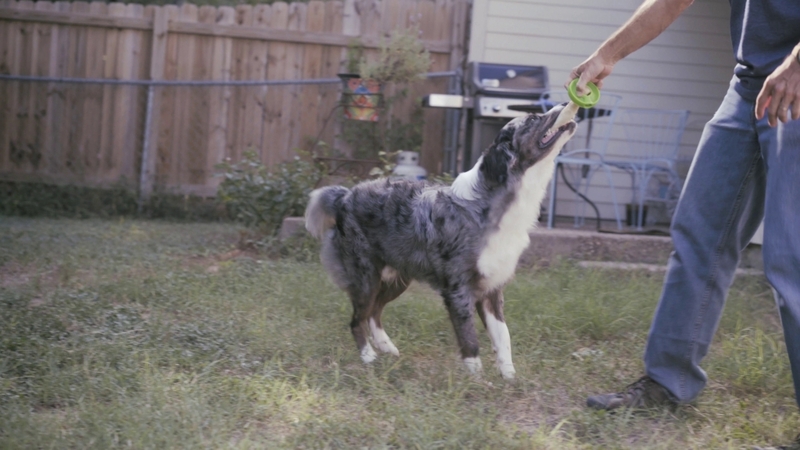 We also can play tug-of-war with the EverChew and throw it all around. Removing the chew locking nylon pin is a double-action process. First, the black rubber latch is moved aside by one finger, while the other hand’s finger pushes the pin free from the backside. The pin head is then pulled mostly out so that the chew stub (if present), can be removed. A new safe chew treat for your dog or puppy is installed by lining up the hole in the chew with the pin. Then push the pin inward through the chew and into the other side of the ring. Make sure the head of the pin slips past the black latch. That’s all there is to it! The latch locks the pin into the ring, and the pin locks in the chew. The rubber latch is easy to use with all finger types and strengths. You see in the instructional video that hand model Robyn has very long fingernails. She moves the EverChew latch with no risk of fingernail breakage. When designing the rubber latch system, I also used my thumbs instead of fingers to make sure they could fit into the ring and unlock the pin. So even if your nickname is “Chubby McFingers”, you can easily refill the EverChew ring with safe chew treats. EverChew is made in USA! We wanted to make sure the quality of the EverChew ring and the materials were high. That’s why we insist on making Everchew in the USA. The polymer used to make the ring is made in USA. The ring is made in USA. The nylon pin is made in USA. The rubber latch is made in USA. You get the idea. We want only the highest quality materials and production methods to be used for the safety of your dog and puppy.